Costa Rica and Panama have begun debates about their upcoming elections. Costa Ricans will hold presidential elections in 2018, while Panamanians will have general elections in 2019. The proximity of both events keeps fanning the debate about their voting systems, which includes the prospect of e-voting. In Costa Rica, the subject of e-voting has gained momentum, and recently the president for Gallup in Latin America, Carlos Dentón, revealed that “a third of Costa Ricans are dissatisfied with the capabilities of the Supreme Electoral Court (TSE)”, according to the latest CID/Gallup poll. Dentón warns that the rising mistrust should be a reason for automating the country’s elections, and revisiting the outdated Costa Rican voting model, even more so after the nation has had successful e-voting tests. It is important to mention that Costa Rica delayed their voting automation scheduled for 2018 due to budgetary constraints. The Supreme Electoral Court (TSE) subscribed to a report by the Electoral Registry Directorate, which concludes “there is no economic feasibility for this project, at least in the short and medium term”, and that resources should be oriented to other priority areas. This viewpoint stems from the considerable sum of money that must be paid for the acquisition of software and hardware, training human resources and educating citizens, but the Court failed to acknowledge that expenses go down considerably after adopting the technology; this because the money required for subsequent elections is only for needed for maintenance. On their part, Panamanian authorities touched on the same subject during a forum held in the Electoral Court about the reform scheduled for their 2019 elections. Panama tested in 2014 an e-voting model designed by the TSE, which reproduces characteristics of systems that have been tried in other countries, so the experiment was successful. In this process, voters, who previously validate their identities, receive a card that unlocks a touch-screen voting machine. Options are then displayed on its screen. In case of mistakes, there is a “clear screen” key. Once the choices have been correctly marked, the device will print a voting voucher that counts as a paper audit trail. In the forum, participants were critical of the fact that, although there is a Panamanian-developed machine, the decisions to develop it further or put it in operation have not been made. There was also talk of the conclusions on voting technology that emerged from this year’s meeting between Central American electoral organisms. There were recommendations to enforce high standards during vendor bids, keep the nation informed about the technology adoption process, reach for consensus, and guarantee a proper educational campaign for the voting model. Given these discussions, Costa Rica and Panama already know that electoral technology is the best tool to get trustworthy voting results, and that its efficient use is vital to make elections secure and win the citizens’ trust. Now it is up to them to choose to change, and improve. Brazil and Venezuela are world leaders in election automation, with years of successful technology-powered polls between them. On the other, there are countries that, for one reason or another, have been stuck in manual polls despite all the grief that the antiquated system is associated with. Such is the case for Argentina and Costa Rica. The former advanced on the objective of installing an automated system on a national scale in 2016, but despite their efforts did not manage to make this change. The latter focused on electoral technology and did not finalize any measure. Argentina spent months debating an electoral reform whose central axis was the progressive adoption of a Single Electronic Ballot (BUE in Spanish). Yet the initiative was abruptly stopped in the senate. In a scathing editorial, the Buenos Aires newspaper La Nacion revealed the disconnect between the Argentinian public’s clamor to overhaul the electoral system and the politicians’ pussyfooting, which hints that the latter stand to lose a lot when automation eventually eliminates vote manipulation. More alarmingly, a scheme proposed by the government for the adoption of BUE’s (the model adopted in Salta) has had a less than stellar performance and had only raised doubts about its capacity so safeguard the voters’ will. On the other hand, lack of funding has stalled the implementation of e-voting in Costa Rica, where election reforms seem to be languishing in the cellar. The Electoral Registry Directorate in fact stated that “there is no economic feasibility for this project, at least in the short and medium term”, and that resources should be oriented to other priority areas. Observers are quick to note that the Costa Rican government should look past the high initial investment needed to implement e-voting and see the larger savings that will be realized in the long term. Admittedly, the cost of acquiring e-voting solutions seems prohibitive at the outset. After all, software, hardware, training, voter education do cost a lot of money. Yet expenses drop for subsequent elections since the only maintenance and small upgrades are needed. When Argentina and Costa Rica resume this debate in 2017, both countries would do well to realize that how important it is for democracies to start modernizing their elections, and how critical it is to select the most secure and efficient automated voting model for their unique needs. Last April 6th, when Costa Ricans voted—on second round—to elect their new president, they not only preserved their democratic system by attending the polling stations, but also supported the transformation process of their electoral system by massively testing the e-voting model that the nation expects to implement in 2016. The event, organized by the High Electoral Court (TSE), allowed voters from various regions of the country to interact, after they had voted manually for their president, with the machines that would modernize their electoral system. 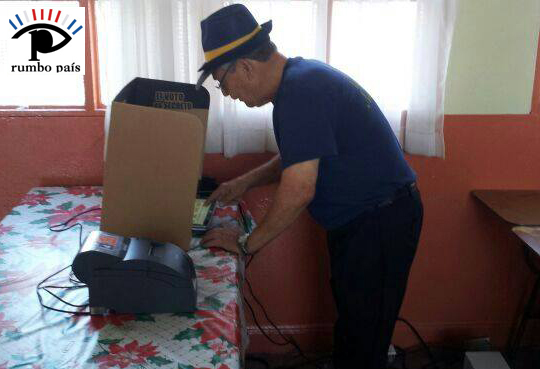 The e-voting system tested by Costa Rica shows similarities to that employed in other countries in the region, such as the US and Venezuela, as it’s based on the use of touchscreen machines where each voter can type his or her preferred options and then the device prints a vote receipt in order for the voter to verify that his or her selection was properly registered. This also ensures that there is a physical backup for each selection. The software design began to be developed in 2011. However, the purchase of the equipments was only made effective between August and September 2013. It was only this year that testing and preparation of the system for the 2016 municipal elections began. This modernization program is being carried by the Engineering Department of the TSE’s Technological Strategy Directorate, and so far it has 50 electronic devices. The experience sets Costa Rica on the path to automate voting, and joining the elite of nations with a modern, safe, and transparent suffrage. TSE’s plans include continuing the tests and taking advantage of student elections at professional schools and universities to keep showing and improving the electronic voting system the whole country is betting on for the municipal elections that will take place in two years.